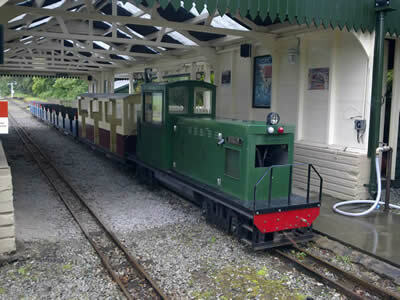 The Weston Park Railway has been running for over 30 years from Weston Central Station and has developed into one of Britain’s premier miniature railways. The one mile journey takes 12 minutes and takes riders through scenic Temple Wood past lakes and woodland, taking in wildlife at every turn. From the Blymhill Drive station the track crosses the lake over the bridge and passes through the beautiful woodland, designed by the legendary Capability Brown in the mid 1700’s. Merlin is our resident locomotive, built specially in the workshop for the railway in 1999; Merlin has done enough miles to reach Australia.